Political changes at the beginning of 1990’s stimulated the need for long term vision and transnational spatial planning of the Baltic Sea Region. VASAB was founded in August 1992 at the Conference at Ministerial level in Karlskrona, which decided to work out a document “Vision and Strategies for the Baltic Sea Region 2010” and set up a Group of Focal Points from all interested countries and regions to monitor the work on the Final Report. The work started in December 1992 and was successfully completed two years later, when the third Ministerial Conference in Tallinn adopted the Final Report under the title “VASAB 2010. 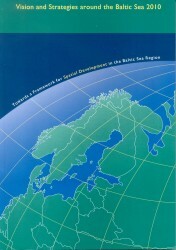 Towards a Framework for Spatial Development in the BSR” (so called “Tallinn Report”). In it’s resolution the Tallinn Conference also outlined an implementation programme, stressing the role of co-ordination between national and cross-baltic spatial planning, bilateral and multilateral partnerships in projects promotion, intensified exchange of experience, and transfer of know how and spatial research in areas of common interest promotion. The fifth Ministerial Conference in Wismar (Germany) in September 2001summed up implementation and set up new goals in VASAB 2010 PLUS Spatial Development Action Programme, calling the CSD/BSR to give more attention to co-operation in the field of spatial development policy at national level. VASAB contributed substantially to the process of preparing content side of operational programmes of Baltic INTERREG II C, III B and a concept of INTERREG IV Initiative. The eight Ministerial Conference in Tallinn on 26 September 2014 discussed the progress on implementing the VASAB Long-Term Perspective for the Territorial Development of the Baltic Sea Region.